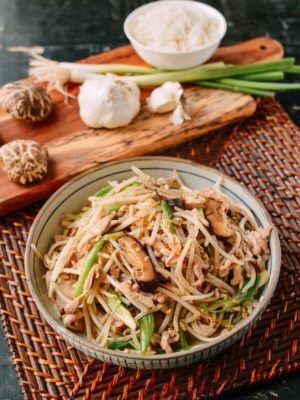 Seasoned simply with soy sauce, sesame oil, and sugar, japchae is a noodle dish perfect for a light lunch or dinner–i.e., when you want something satisfying but not too heavy, and/or are tired of an endless parade of salads. 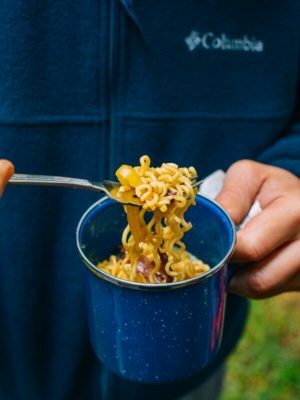 In fact, if you were to pack these noodles up in a few containers for the beach or an outdoor picnic, you’d totally be winning at life. 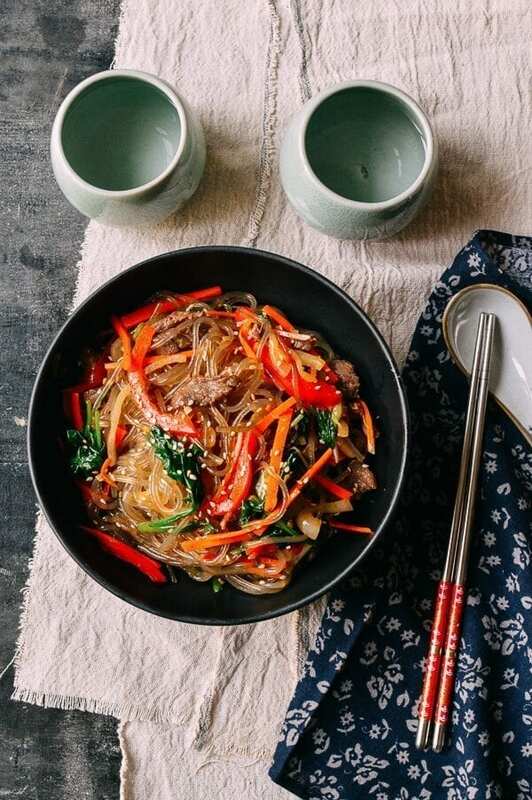 Many readers have requested a japchae recipe from us, so this one is long overdue! 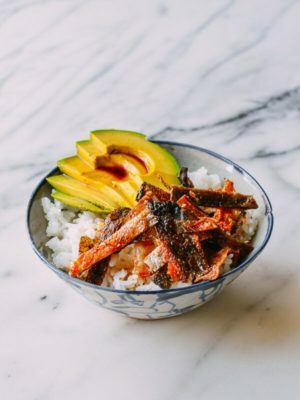 Check out some of our other easy Korean recipes here. 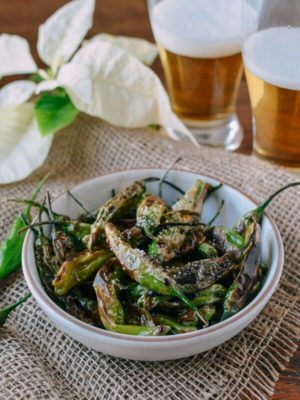 Note: This recipe was originally published in June 2017, and has been republished with updates! 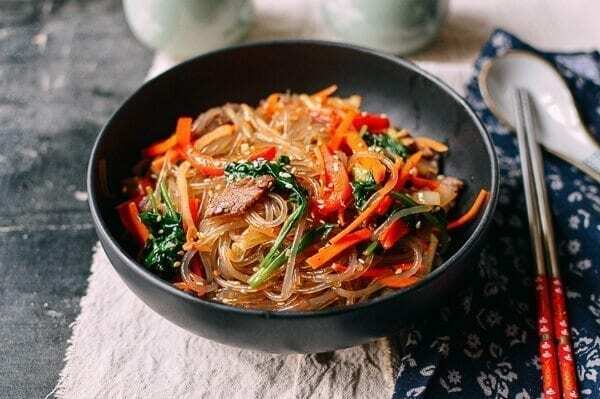 Japchae is a simple Korean noodle dish jam-packed with a rainbow of vegetables and accented with a hit of flank steak. 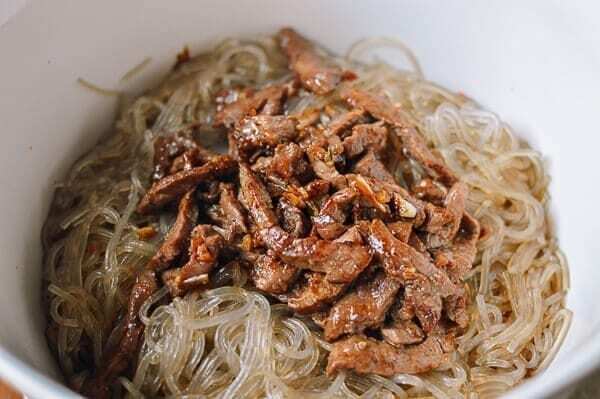 Japchae is made with Korean potato starch glass noodles, which are surprisingly light, and completely gluten-free! 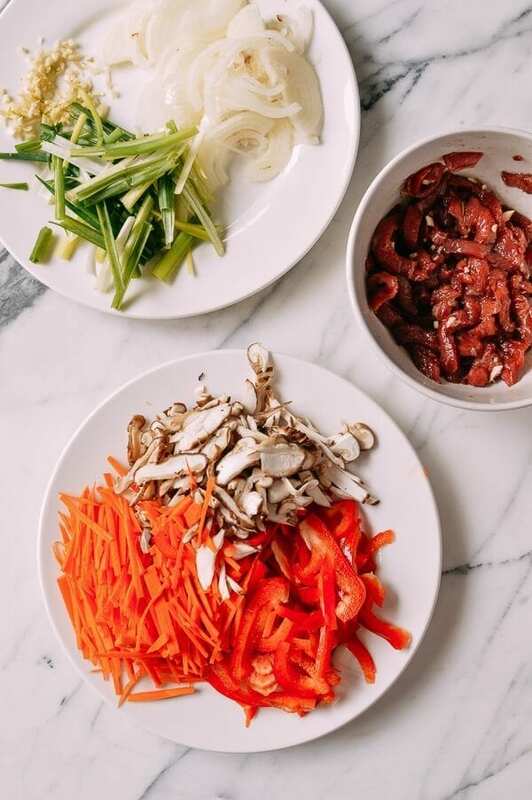 As is the case with many of our favorite Chinese dishes, this Japchae recipe is a bit heavy on the chopping, but once you’re over that hump, it’s pretty easy to put together. 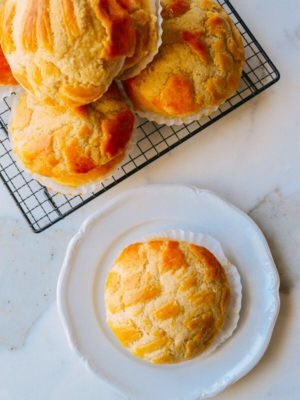 Do yourself a favor and do what I did–make a big batch! 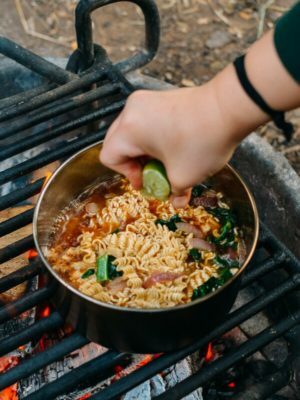 These noodles are pretty great cold or reheated the next day. 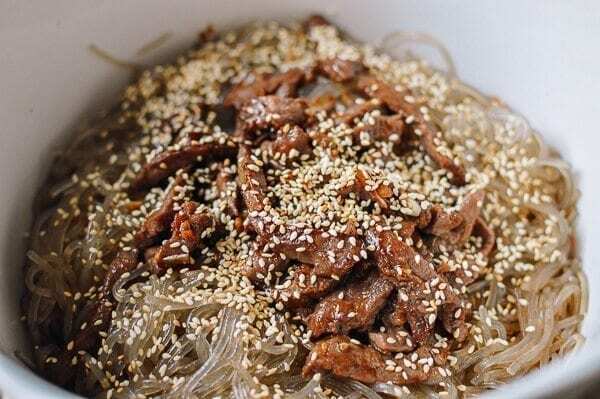 Mix the beef together with 1 clove of the garlic, 1 teaspoon sugar, ¼ teaspoon ground black pepper, 1 tablespoon soy sauce, and 1 teaspoon of sesame oil. Prepare the vegetables, and set aside. 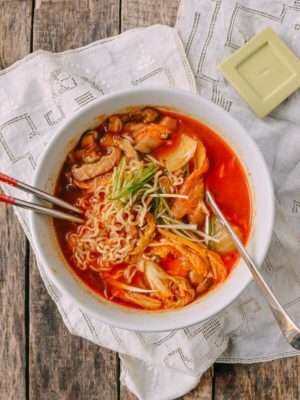 Cook the noodles for 7 minutes in a large pot of boiling water. Strain and cut with kitchen scissors so that they’re a little shorter. 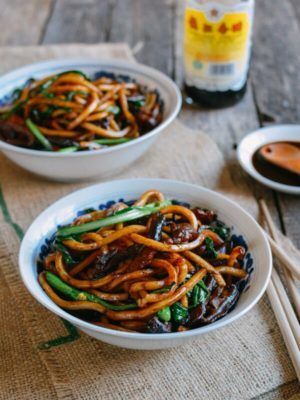 Add 1 tablespoon sesame oil, 1 tablespoon soy sauce, and 2 teaspoons sugar to the noodles. Toss thoroughly. Heat up a skillet over medium high heat. Stir-fry the onion and carrot with 1 tablespoon of vegetable oil until tender, but still a little crunchy. Transfer to a large mixing bowl. Add another tablespoon of oil to the pan, and add the mushrooms. Cook until caramelized, and transfer to the mixing bowl along with the onion and carrot. Add another tablespoon of oil to the pan, and cook the red peppers until tender. Add in the spinach, scallions, and the remaining garlic. 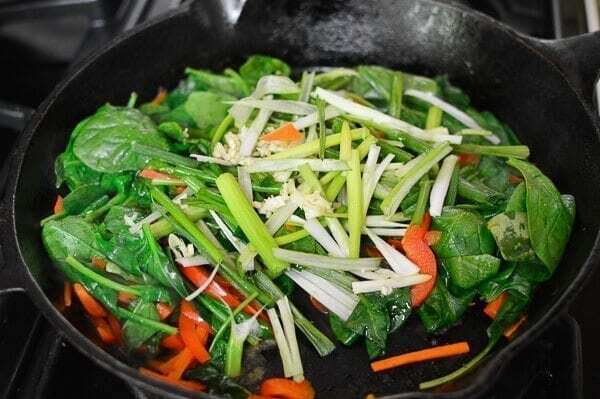 Cook the entire mixture until the scallions and spinach are wilted. Transfer to the mixing bowl with the other vegetables. 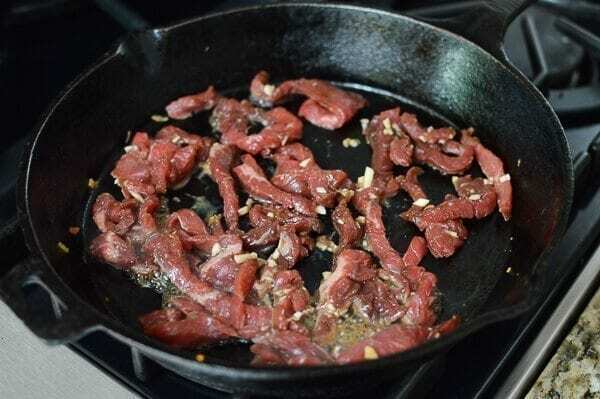 Turn up your heat to high, and add the beef to the pan. Stir-fry for a couple minutes until the beef is no longer pink. Along with the sesame seeds. 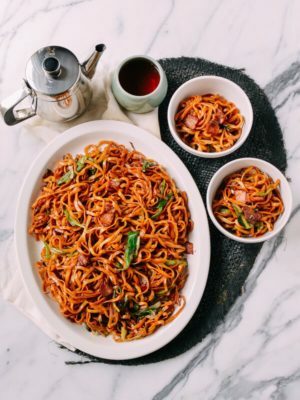 Add 3 teaspoons sugar, ½ teaspoon ground black pepper, 2 1/2 tablespoons soy sauce, and 1 tablespoon of sesame oil to the mixing bowl full of ingredients. 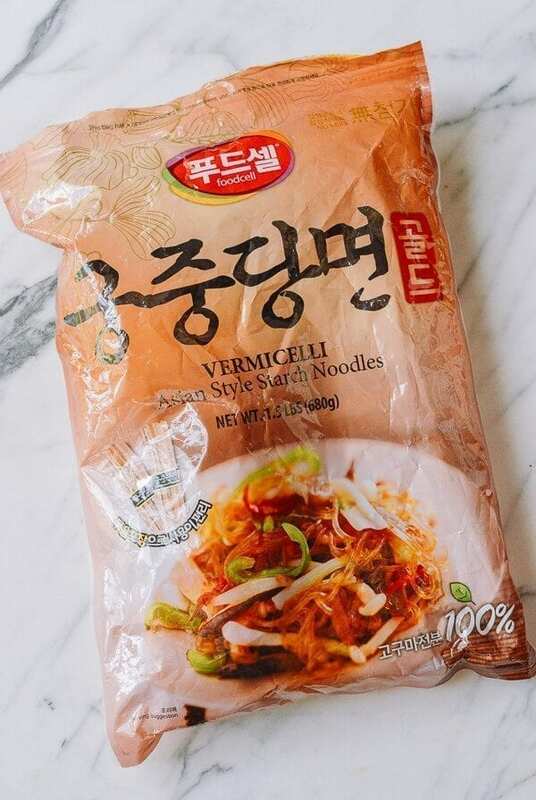 Toss to combine all the ingredients together and serve this Korean Japchae noodles hot! Japchae has just the right amount of salty sweetness that is characteristic of Korean cooking! 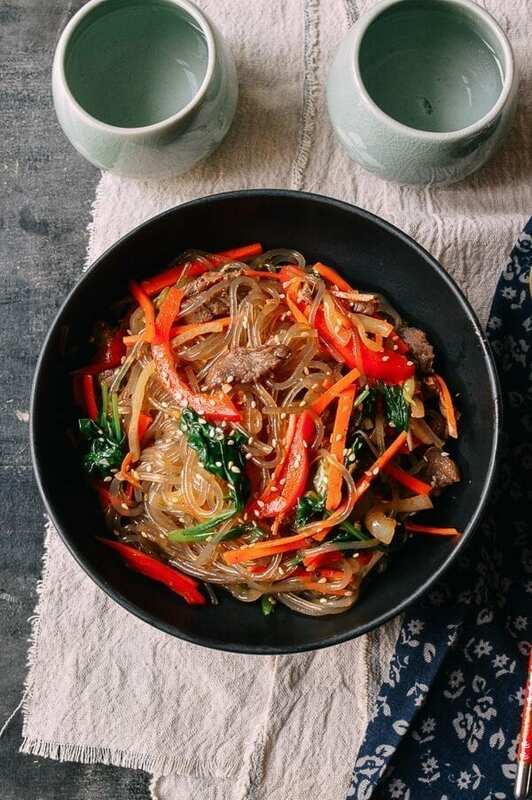 Japchae is a simple Korean noodle dish packed with a rainbow of vegetables and accented with a hit of flank steak. 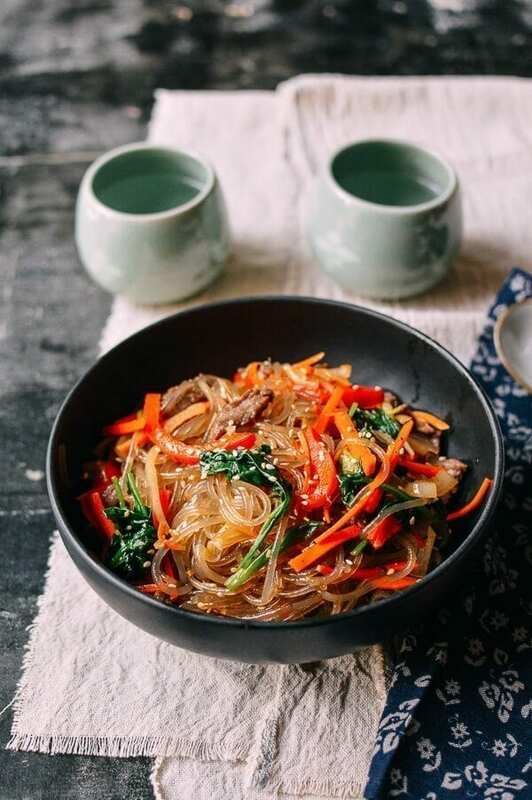 Japchae is made with Korean potato starch glass noodles, which are surprisingly light and gluten-free! Prepare the vegetables, and set aside. 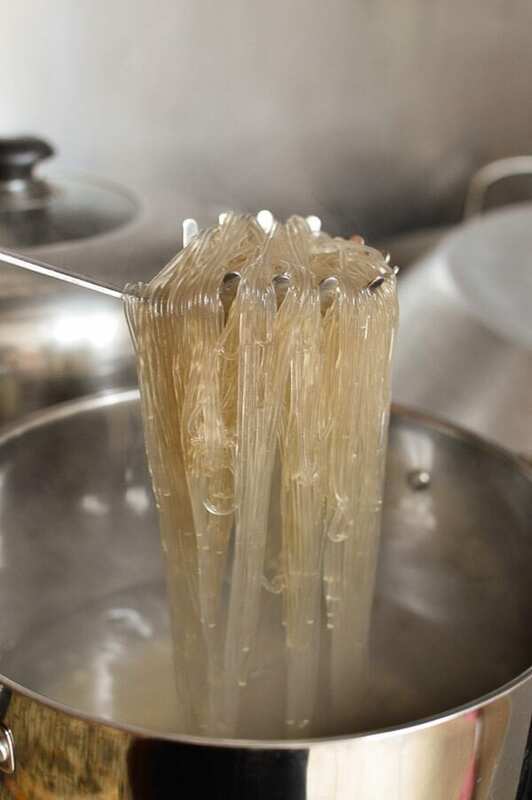 Cook the noodles for 7 minutes in a large pot of boiling water. Strain and cut with scissors so that they’re a little shorter. Add 1 tablespoon sesame oil, 1 tablespoon soy sauce, and 2 teaspoons sugar to the noodles. Toss thoroughly. Heat up a skillet over medium high heat. 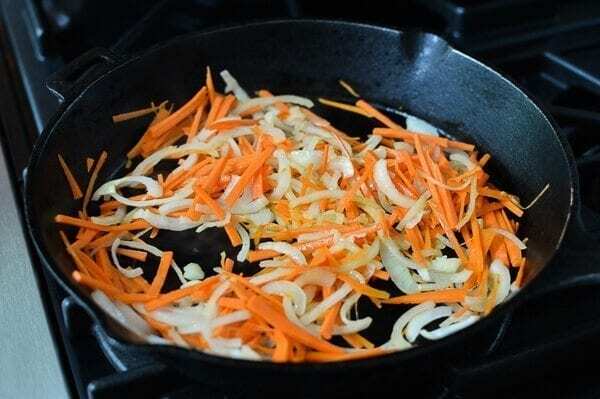 Stir-fry the onion and carrot with 1 tablespoon of vegetable oil until tender, but still a little crunchy. Transfer to a large mixing bowl. Add another tablespoon of oil to the pan, and add the mushrooms. Cook until caramelized, and transfer to the mixing bowl along with the onion and carrot. Add another tablespoon of oil to the pan, and cook the red peppers until tender. Add in the spinach, scallions, and the remaining garlic. 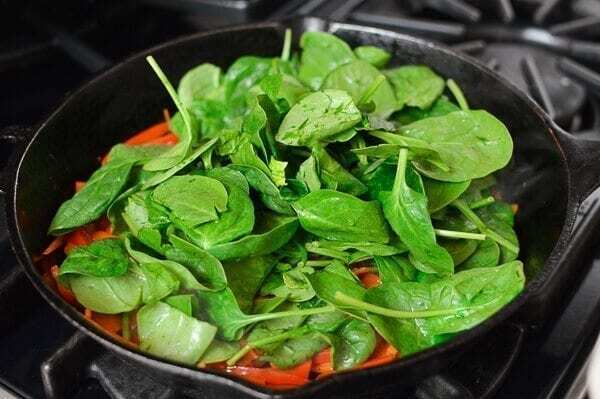 Cook the entire mixture until the scallions and spinach are wilted. Transfer to the mixing bowl with the other vegetables. 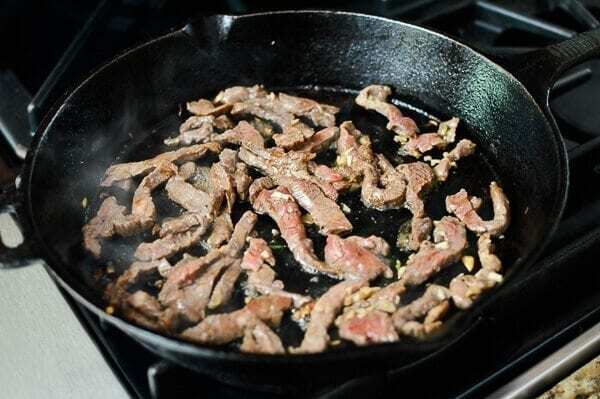 Turn up your heat to high, and add the beef to the pan. Stir-fry for a couple minutes until the beef is no longer pink. Transfer the noodles and the beef to the mixing bowl, along with the sesame seeds. 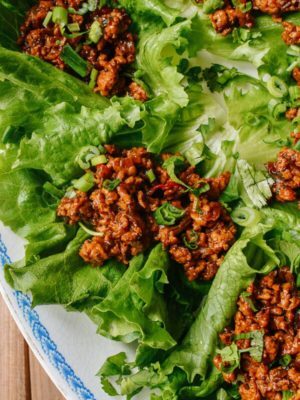 Add 3 teaspoons sugar, ½ teaspoon ground black pepper, 2½ tablespoons soy sauce, and 1 tablespoon of sesame oil to the mixing bowl full of ingredients. Toss to combine all the ingredients together, and serve. Kaitlin, I made this for dinner tonight & enjoyed it so much. I could hardly stop eating! It’s one of those great recipes that I’ll make again & again. I confess I’ve been lurking around your blog for a long time. It’s given me the courage to venture into Asian groceries for good & authentic ingredients. Thanks to you & your family for sharing. Your blog is one of the best ones out there. Hi Mary, I just made this again as well for dinner the other night, and couldn’t agree more. Thanks so much for lurking, reading, and cooking ;) We love hearing from our readers! 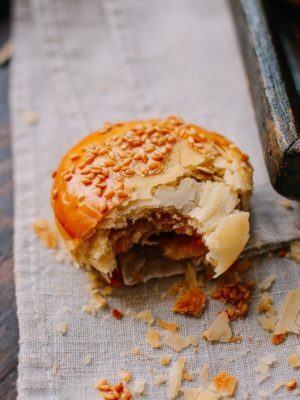 Would like to try the recipe but concerned about the amount of sugar in it. Can I omit the sugar ? Could I use honey instead of sugar? This was an easy and delicious recipe. 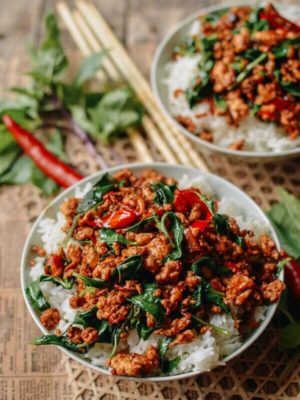 Always looking forward to trying your great recipes ? 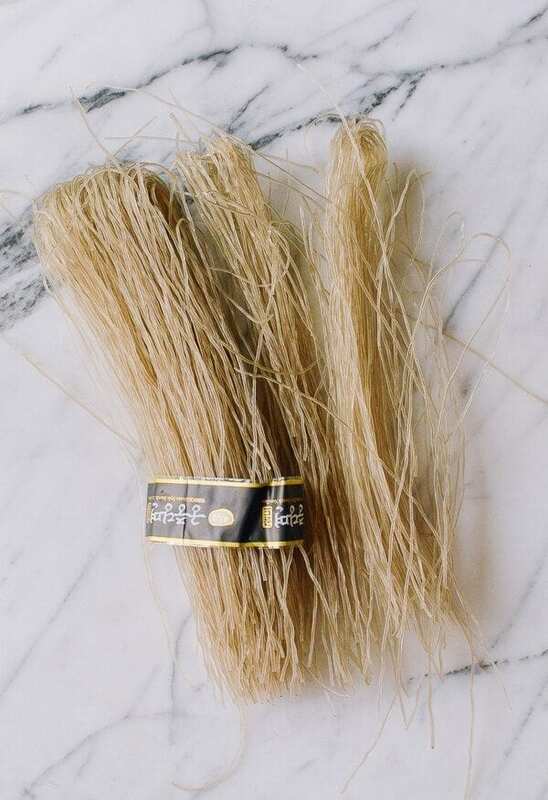 Would that work with glass noodles? I made this tonight. So very tasty and turned out just like the picture! 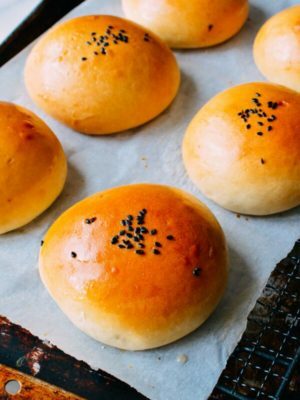 I’ve tried many of the recipes here and every single one is a success. Your site is my very favorite in all of internet land. 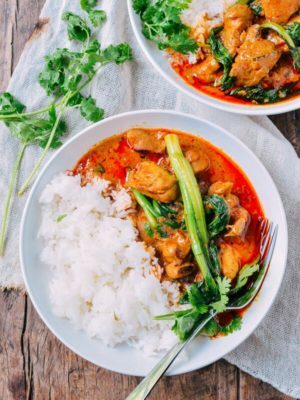 This dish is delish! So excited to try this recipe! My friends and I have been on a Korean fix lately and we were just saying that a japchae recipe needs to happen ASAP! Btw, what a wonderful blog you guys have! 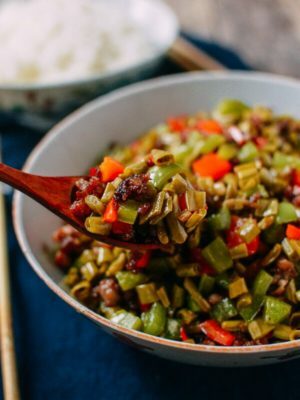 I’m Chinese myself and there are a ton of recipes here that we used to eat when I was living at home with my parents. 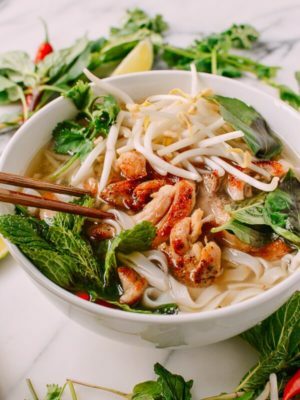 Now that I have my own family, it’s nice to be able to share some traditional dishes with them as well – and I get to see the surprised looks on my parents faces when I make them something they think only they know how to make! Great job folks! Yes….thank you, thank you, thank you!! 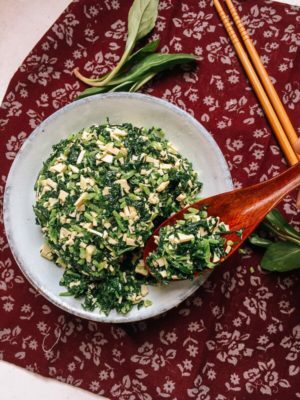 I love japchae and can’t wait to give this a try. 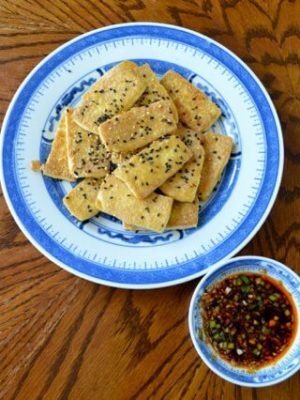 I’ve made your rice cakes and stir fried eggplant recipes and enjoyed them both. Looking forward to making this and many more of your recipes. 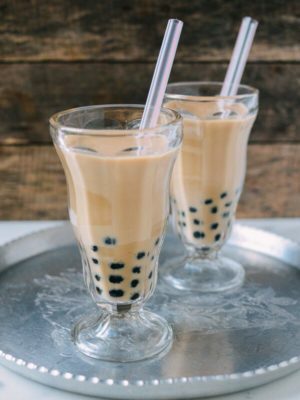 I am looking for a recipe for a baked tapioca recipe as well if you have one. I just prepare this recipe the other day. After all the vegetable has been cut, I omit the meat and it was simple, toss the vegetable and I used instead sweet potato noodle gluten-free. It was very good. Hi Cathy, glad the recipe worked for you! Cheers! I love you guys! Your posting is of such frequent consistency that we keep coming back for more. Your writing is witty yet so informative, it makes the amateur cook yearn to jump into the kitchen and tries the recipe. Keep up the good work, guys!